Bout Tree Fiddy is a multiple stakes winner of more han $136,000. CLAREMORE, OK�SEPTEMBER 29, 2017�Bout Tree Fiddy, a multiple stakes winning son of IVORY JAMES finished third in the $17,500 OQHRA Fall Classic at Will Rogers Downs on Friday, September 29. 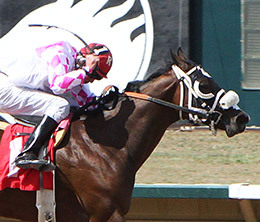 Patrick Swan conditions the 3-year-old for himself and co-breeder Carry "Rusty" Allred. Out of the Fredricksburg mare Hollie Jollie, Bout Tree Fiddy has compiled a (16) 4-2-5 record and banked $136,197 in two years of racing. He won the Rocky Mountain Futurity at 2 and was second in the Jack Brooks Stakes and third in the Canterbury Park Derby this year. Larry Payne was aboard in the OQHRA Fall Classic.